When you’re taking in the fresh air, enjoying the gorgeous panorama, and feeling the warmth of hospitality, you’ve truly arrived – arrived at our Hotel Gamshag. Our house is located at the heart of Hinterglemm’s traffic-free centre, where you can expect hospitality, familial atmosphere, and delightful Salzburg and international cuisine. The surroundings of Hotel Gamshag feature a vast paradise of indulgence. Get to discover the region around Saalbach Hinterglemm and enjoy yourself. The Gamshag relaxation regimen is pure luxury. Leave the stress of everyday life far behind in our spa area featuring various saunas, a relaxation room, solarium and whirlpool. Active-holiday tourists find a range of exciting sports and leisure time activities starting right outside the hotel. In winter, we invite you to check out the directly connected Skicircus Saalbach Hinterglemm Leogang with more than 200 kilometres of pistes and slopes for skiers, snowboarders and cross-country skiers. The diversity of summer is best enjoyed by hikers, mountain bikers, and those looking for a quiet spot to rest and recover. 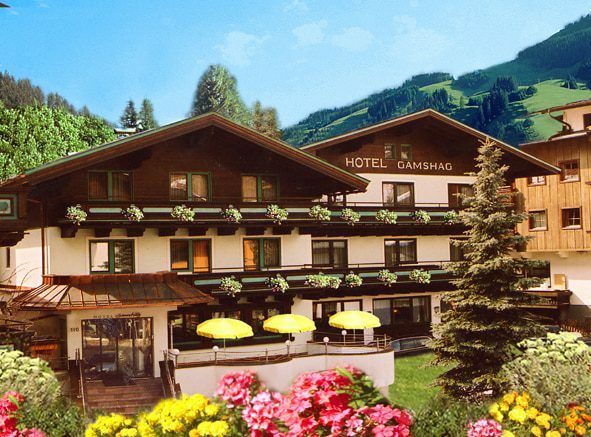 Power down, relax, arrive – no matter whether you’re looking for peace and quiet, or are seeking out an active holiday in this beautiful region: Feel completely at ease at Hotel Gamshag, your hotel in Saalbach Hinterglemm. Send us your non-binding inquiry or book your delightful stay directly.